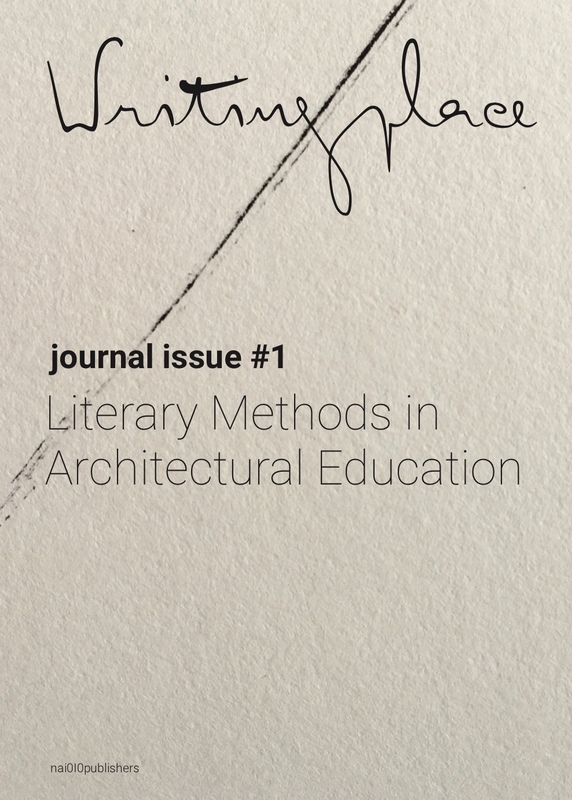 The topic of the journal’s first issue, Literary Methods in Architectural Education, derived from our observation that many of the contributors to the 2013 Writingplace conference shared a particular practice: that of architectural education. Realizing that many scholars interested in the crossovers between architecture and literature find room to experiment, particularly in the environment of seminars and studios, we decided to dedicate the first issue of the Writingplace journal to this topic, in the hope of creating an international dialogue upon the topic of architecture and literature within the space of architectural education. Several pedagogical experiences in architecture bring literary inputs to teaching, through a multidisciplinary curriculum with courses explicitly focusing on these relationships. Other pedagogical scenarios, even if admitting the relevance of literature references into design, have blended these semantic and structural translations implicitly in their teaching processes. The main goal of this article is to acknowledge the many voices of an implicit transfer between literature and architecture within a learning scenario at the Escola Superior de Belas-Artes do Porto (Fine Arts School in Porto) along with practice.Here, a process of modern acculturation was key, while aiming at modernity filtered by the local culture and tradition, and vice versa. One of its essential figures, Fernando Távora (1923-2005), recurrently quoted Fernando Pessoa while sharing his ideas with students. Reflecting on life and architecture, space and the world, Távora’s discourse was intuitively pedagogical. Fernando Távora embedded literature in his learning and teaching, while being highly engaged with everyday experience and practice. Távora integrated in his lifelong learning the writings of Fernando Pessoa, which among others implicitly contributed to the School of Porto. The article reflects on written essays of Fernando Távora and Alexandre Alves Costa and on architectural works by Álvaro Siza and Eduardo Souto de Moura. For the first, we will consider a specific period in the school, when architects had to complete written and designed pieces to become professors, while for the latter we will pick few architectural examples that illustrate the main argument of this paper. in the design and building processes of the school projects, and the way in which the professors and students of the School of Valparaíso proceed with their works after the poetic act that takes place at the start of every project. By clarifying these points, we shine a light on the presence of poetry in the articulation of the school’s artistic production and academic structures, locating the relationship between word and action at the centre of the school’s debates, where it remains open and vividly discussed to this day. Every place is built around shared values, norms, histories and myths that are assumed, implied, or tactfully left unsaid. Architecture is at its core an accomplice to the untidy matter of human stories and aspi- rations, even if the architect’s work typically results in concrete and measurable compositions. The making of architecture, in every one of its pleasures and difficulties, involves the crucial task of interpreting among tangible materials and the multitude of implicit forces that characterize a particular place. My proposition is that literature and storytelling can play an essential role in this interpretive task, and that they are especially fruitful for architectural pedagogy. a verb rather than a noun, an action rather than an object. The final projects emerged through a series of exercises that required students to translate between tactile and literary mediums. With Project Daedalus, literary constructs suspended commitment to a final and concrete outcome, while opening up the opportunity for play. This paper examines the role of narrative in the briefing and performing of the actions held by the international network Urban Emptiness. The network proposes an interdisciplinary investigation of emptiness and silence through workshops in different contemporary cities. Narrative is examined here as the protagonist of performative explorations of different layers of the urban fabric that might even be hidden or unnoticed. Focus is on two groups of events held in Edinburgh and Athens. Organically interconnected these two clusters of actions explored narrative in briefing process (using performative, deconstructing and montage methodologies), performance (walking itineraries, oral history, site/process specific designed sketchbooks), documentation and communication. Of particular interest was the investigation of ‘narrative threads’ between the different episodes by introducing thread-workshops which were shifting the focus and re-framing the actions. Working with modes of narrative involves observations about the way we live and act, but also about the way we communicate our experiences. These narrative experimentations suggest a playful take on how we introduce diverse points of view and explore new ways of expression in a fusion of horizons that is never considered as a closed and totally complete model. Inner and outwards landscapes, real and imaginary elements, tangible and intangible qualities were re-situated in the examined performative fields through the agency of the participants’ bodies and the dynamics of a plot that aimed to remain open. Allowing for new episodes to be incorporated and interruptions to happen in its course this process unearthed the existence of an evolving and organic urban narrative that is always open to incorporate new episodes. Engaging the example of “The Word-Collector” project – an experimental design studio taught recently in the Post Professional Masters, School of Architecture, McGill University – this paper discusses a literary approach in architectural design; one that explores the possibilities of written language as a tool of architectural representation. The paper presents the theoretical background of the approach discussing the importance of language for architecture, explains the project’s specific stages, documents selected outcomes, and concludes by elaborating on the implications of the suggested pedagogy for architectural education nowadays. This linguistic architectural design process developed in three stages. Through their word-collections and the related narratives, the students engaged in a unique understanding of the city. Deliberately framing perception and forcing a personal, emotional engagement, the city revealed deeper inter-subjective meanings. Through the different forms and modes of writing, engaged during the project’s second part, the students attempted to envision an appropriate architectural space responding to both the city and the program. Lastly, oral language and narrative forms became a way to speak about the experience in the imagined new places on behalf of its potential future users. The ‘Word-Collector’ put forward a ‘theoretical project,’ a fully autonomous architectural design vision constructed solely of words. There are two kinds of dreams. There are the dreams that we share, and there are dreams that are our own. Architecture, and the politics of dreams – or the dreams of politics, for that matter – form the context of this essay, and in particular how this thematized a design project in South African architectural education. In the South African context, where the past is often experienced as a nightmare, a fundamental inquiry into the precepts of architectural design and shared history has the potential to relocate repressed events of trauma. These events, which currently exist primarily in the historical record, can be translated into the present, and shown to still be active, but exerting their effects surreptitiously. This essay aims to presents brief readings of three design-research projects conducted in Unit 11 of the Graduate School of Architecture (GSA) at the University of Johannesburg. A number of projects are being developed which work through (rather than resolve) concerns of material memory, cultural edifices and politics, employing metaphors of ghosts, nightmares, phantom limbs, exquisite corpses and plastic identities. By illustrating (or designing) such conditions, the unit attempts to bring to the surface some of the historical fragments haunting the South African collective subconscious. Design-research students are encouraged to make associations more or less freely in the early stages of the design process, after which, through critique, reflexive relationships are established between designed work and its interpretation. The unit makes extensive use of allegory and figuration to create a slight distance between the students’ immediate frame of reference and the complex political realities with which the projects are entangled. This method allows students to expose and interrogate their biases and proclivities. The projects define architecture as a collective dream, condensing, sorting and forgetting our (shared) history. Within this article, a curious storyteller will guide our way to remotely situated islands and their marvellous stories and stubborn inhabitants, invented by students. In the summer of 2016, the bachelor diploma students of the department of Wohnbau at the RWTH-Aachen University were asked to develop a dwelling for a lighthouse keeper, a house with a beacon. Within this article, we aim to give an insight into the project’s boundaries, by describing the project brief and our tutoring approach. With this article and the introduction of our own curious narrator, we intend to show how our approach has resulted in a great variety of narrated tales that were combined with profound building techniques and methods. The literary framework of the assignment, departing from a place that could not be visited and from a particular character, made the student's observations and readings of both programme and context extremely focused. The students explored their islands and treated the challenges for their protagonist to dwell on them in an accurate manner. They became sensitive to basic conditions of dwelling, such as landscape, climate, materials, building methods, and applied these conditions in their distinctive and tangible design solutions. In addition, the game rules of the entire project, in combination with the detailed requirements for the final presentation, helped to examine the skills and knowledge we deem indispensable to obtaining the bachelor’s degree. The students gained the understanding necessary to handle a relatively small architectural design project from concept to detail through imagining their own narrative framework and making their unique design of a lighthouse the starring role of their very peculiar and fantastic story. Literature has the ability to grasp atmospheres, to look at things from many points of view, to deal with the pragmatic as well as the poetic, with creativity and subjectivity; these and other qualities offer a wealth of possibilities to design. This graduation project tried to define both the possibilities offered and the ways in which to employ them in the traditional design process. In doing so, literature was both a tool to understand and to create, a method to engage the mind and fuel creativity. Throughout the different phases, it is a tool to read, to write and to continuously challenge all the elements of a design, from analysis to scenario, from site to detail. In this way, the two key elements of the project, the mountain and the book, were defined and declined in the design of three libraries in the area of Meran in the Italian Alps. The literary tool, in all its declinations, is also employed as a different way to engage one’s own creativity; it provides both a rational way to explore and deal with space and a poetic view that ‘illuminates’ the design task and allows to deal with inspiration and concepts in a varied and versatile way. Literature being an added tool to the design process, the literary material is constantly confronted with design through graphical means in a loop process. In this approach, the designer acts as an authoring medium between the site and the design that has to take place in it. life taking place within them, I employed site writing as a mode of investigation. I developed Narrative Inhabitation as a practice of personifying the city, giving it a voice that describes the life happening within it. My method of inhabitation involved writing about the everyday life of Bogotá, in the form of a series of monologues told by architectural elements of the city itself. Narrative Inhabitation helped overcome the constraints of limited time and local unfamiliarity to give a deep analysis of the elements, encompassing their history, their changing relevance and their daily rhythms. Inhabiting the elements with site writing helped produce a breadth of analysis as I inhabited the city, forcing me to thinking empathetically and go beyond my own subjective experience. By writing the city I have been able to investigate the emotions and personal motivations that Bogotá’s elements provoke, the semi-fiction of the monologues giving me space to imagine and suppose whilst still creating a sense of place, accurate and useful for understanding the city’s operation. In the 2017 spring term, the design studio of Public Building at Tampere University of Technology in Finland set a design task for a building that not only occupies and strengthens an urban place in Tampere but also presents imagined spaces: a museum for the stories, characters and places of the Moomin graphic novels by Finnish illustrator Tove Jansson. These graphic novels form the cultural and literary heart of many Finnish childhoods. For the design of such a cultural building, questions of place, landscape, the experience of spatial and material qualities are crucial. The project by Diana Rimniceanu begins with a museum in search of a place of its own in the city of Tampere. The museum extension aspires to express the Moomin stories through an architecture that is specific and autonomous, capable of preserving the richness and uniqueness of the place while revealing the unexpected landscapes that it hides; an architecture that grows gradually, scene by scene, creating encounters between the Moomin creatures, the historic industrial buildings and the new visitors. The intervention reveals through space a sequence of atmospheres rooted within the darkness and light of the Moomin stories while balancing between the reality of things and imagination. or utopias. The project here is one of such concepts, and perhaps also a radical and pessimistic one. The protagonist takes his frustration with an escapist attitude, leaves his city behind and tries to find his joy and purpose of life in a natural and prescientific environment. He arrives at a faraway island in Scotland, where natural elements, not rational human beings, are the dominating force. I designed various instruments or observatories for the modern man to get in touch with what he yearns for – nature: through folklores and tales he regains a prescientific eye; through the instruments, he experiences the varied elemental existence of nature – sun, moon, stars, water, fire, wind, waves . . .
During this project I got inspiration from reading, writing and collecting. Travel logs written by English scholars, who travelled to Scotland in the eighteenth and nineteenth centuries, as well as folklore and tales of the Scottish islands were great inspirations; like a time machine, these words took me a few hundred years back to a prescientific state of mind.